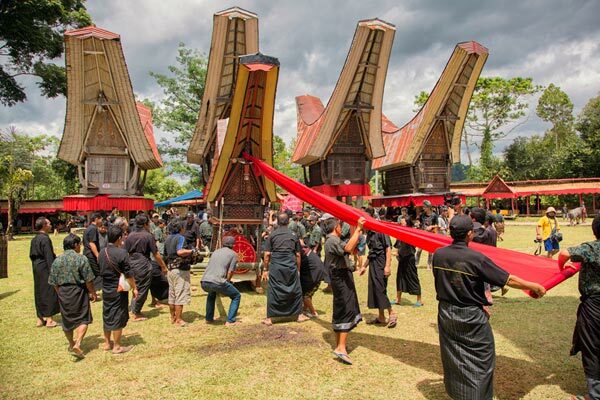 Although not on Flores, we offer an exciting side trip to Sulweis and visit Toraja Land. This very unique culture has opened to the world their long isolation only since the beginning of the last century. The Toraja today still adhere to their age-old beliefs, rituals and traditions, although many of her people are modernized or have embraced Christianity. When one travels to the Tana Toraja highlands, therefore, expect to be awed by the spectacular beauty of nature, at the same time experience how communities have through the ages sustained their beliefs and traditions in splendid isolation in order to survive this eternal cycle of life and death on earth. Day 01 Airport-City tour-Check in Hotel in Makassar. Arrival at Hasanuddin airport in Makassar to meet with our guide and then drive to Makassar city for about 20km. We will visit the old fortress of Rotterdam, built by 9th king of Gowa and the old Buginese harbor in Paotere. Depending on arrival we will either have lunch at local restaurant and/or dinner prior to staying overnight in Hotel Pantai Gapura. After breakfast, drive to Bira which is 180 km from Makassar. On the way you will visit Balla Lompoa in Sungguminasa,Gowa as it was the palace of Gowa Kingdom. We continue the drive to Biraw with lunch enroute. In the afternoon, you will stop to visit Tanaberu, a village where the Pinisi and other typical Bugis and Makassar ships are built out of the native wood. These builders do not use blue-prints and build the boats will natural products. We then continue to the Bira Beach area with dinner and overnight at Anda Beach Hotel. After breakfast, departure to Sengkangvia Sinjai and Bone, which is 230km away. We will have some great photo stops on the way. After lunch enroute, you arrive in Sengkang and visit Tempe Lake to board a local fisherman’s boat to see the unique floating houses in the middle of the lake. Overnight in Pondok Eka Hotel after dinner at local restaurant. After breakfast you depart to Toraja via Siwa and Palopo. On the way you will have some fantastic photo stops, such as in Puncak Palopo where you can see a panorama of the rich mountainous area. After lunch enroute at local restaurant, you arrive in the afternoon at Toraja. Overnight at Misiliana Hotel after dinner at local restaurant. The next two days offer a unique experience with the local Torajan culture. After breakfast, we visit Lemo that houses the stone graves with statues depicting those that have been buried there. You continue to Londa, a village with old coffins, the Tau-tau cave, which are used as graves and then visit Babygrave on trees in Sangalla. After lunch, we continue with visiting Kete Kesu, a village with the fantastic typical Toraja houses and ricebarns. After a full day, you go back to hotel Misiliana and dinner at local restaurant. After breakfast, we will drive to Pallawa, which is an old village with many Toraja houses and ricebarns. Then we continue to drive up to Batutumonga to see the wonderful mountainous panoramas of rice terraces dotted with the local Toraja houses. Lunch at Local restaurant. It will be possible to do some soft walking along the way and visit the locals. After another full day, we drive back to Hotel Misiliana and dinner at local restaurant. After breakfast, you leave from Misiliana Hotel to airport in Makassar via Enrekang and Parepare. We will stop at Bambapuang in the mountains with view the wonderful landscape before we continue further down to Parepare. Lunch at seafood restaurant and then in the afternoon, you arrive at Hasanuddin airport for next destination or hotel for morning flights. Flight from/to Denpasar by Garuda Indonesia, Nam Air or Lion Air.